Husky Sledding at the Foot of the Jotunheimen is a flexible and easily-reached dogsled experience taking place in a beautiful mountain region just 4 hours from Oslo, with tour options of varying duration from 2-5 days (longer tours also possible for private groups). 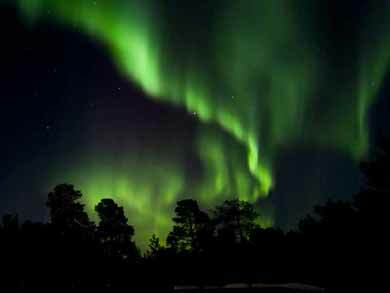 The majority of tours take place in and around Langsua National Park, a stunning area of more than 1000 square kilometres and Norway's most recently designated National Park. The park contains beautiful wilderness areas of rugged alpine mountains and also lowland boreal forest with many lakes and streams. The area is rich in wildlife, with lynx, moose, fox, wolverine and reindeer all making their home here. You are likely to encounter tracks from a number of these animals during your tour - while many are shy and not easily seen, you may occasionally catch sight of animals during your tour. The area boasts some of Norway's most spectacular mountain scenery. Photo: Nature Travels. The 5-day tour also runs in part (conditions permitting) in sections of the mighty Jotunheimen National Park, one of Norway's premier hiking areas and also a wonderful region to experience in wintertime. Tours 3 days and longer begin with a day tour in the beautiful landscapes closer to the kennels to build up confidence and skills, with overnight at simple cabin there. For the following days, you then head deeper into the mountains for the expedition component, where accommodation is in simple wilderness mountain cabins along the route. 2-day/1-night tours begin directly with sledding into the mountains for overnight in wilderness cabin. On all tours, camping equipment is also taken as a backup in case weather conditions require a night in tents. With typically heavy winter snowfall in the region, tours are possible until the early spring. Photo: Beitostolen. NB: Unlike many of our dogsled experiences, these tours do not include arrival/departure day in their duration. For example, a 3-day tour has 3 days' sledding, starting in the morning of Day 1 and ending in the afternoon of Day 3 in time for onward travel. You will need to arrive in the area the day before to overnight locally, either in the cabins at the kennels available as an optional extra or elsewhere in the Beitostølen resort area. Being located just 4 hours by direct bus from Oslo, associated travel costs may be considerably lower compared to travelling to more northerly locations. Norway's highest mountains are located in this region, which offers a high degree of snow security and a long winter season, as well as some of Norway's most spectacular mountain scenery. Weather conditions can of course vary in any location, but the presence of high mountains typically means dependable snow conditions until late into the spring winter - it is normally possible to sled in this area until late May, which is remarkable given its relatively southern location. 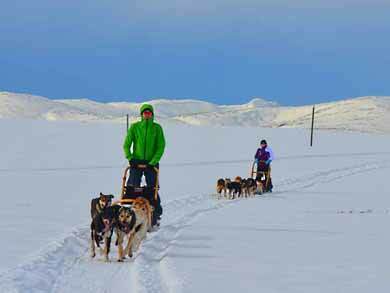 The sleds used on this experience differ from our other dogsled tours. For tour durations 2-5 days, "tandem" sleds are used, with two persons driving at a time. Each person has a brake and takes an active part in controlling the sled and the team. There is also the option to arrange to drive own sled as an optional extra - please see price information for details. The tours run in rugged mountain terrain and often in areas with no pre-prepared trails. A tandem arrangement offers much greater control, as there are two persons available to assist the teams and sled by pushing uphill and with breaking the sled on steep descents. When minor problems arise such as a tangle in the lines, one person can anchor the sled while their partner sees to the team. With a tandem sled, you are able to experience driving a larger team than would normally be used for a single sled. 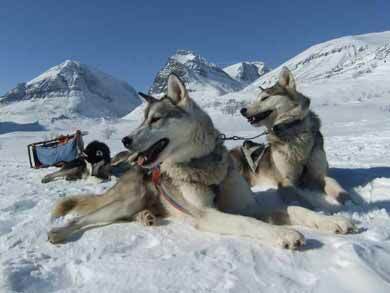 For a tandem sled, you will normally be running a team of 5-7 Alaskan Huskies per sled. Neither person is riding as a passive passenger - both persons take an active part at all times, but a tandem arrangement does provide more opportunity to enjoy the views and perhaps take pictures compared to a single sled arrangement. All persons will have regular opportunities to change position/tasks during the tour. Where groups contain an odd number, odd-numbered participant may share driving with the guide or the tour may take a solo sled (when the intention will be for participants to swap during the tour). For group sizes 7-8 persons, two solo sleds may be taken for additional storage space. Husky Sledding at the Foot of the Jotunheimen is ideal for those wishing to experience the adventure and challenge of mushing in a mountain environment combined with convenient travel connections and the opportunity to a range of other winter activities in the area before and/or after your dogsled tour. The tours are suitable for adults and older children (min. age 14) and the choice of tour durations gives you the chance to find the best fit based on your available time and the level of challenge you are looking for. This experience is also available as private tour on other dates by arrangement for groups of 3-8 persons. Durations longer than 5 days are possible on request. For this experience, accommodation before/after the tour is not included. The itineraries begin in the morning and the last day of sledding ends in the afternoon. You will need to overnight locally at minimum one night before your tour. On departure day, there is normally a bus to Oslo departing 18.15 and it is possible to take this bus if you wish. Tours will finish back at the kennels around 16.00. Alternatively, you may wish to spend additional overnight(s) locally and do other activities in the area. There are a number of accommodation options for your extra nights available locally in the Beitostølen resort area. If time permits, we strongly recommend you plan additional day(s) in the area to enjoy other activities the region has to offer - we are happy to provide suggestions. Transfer from/to accommodation locally in the Beitostølen resort (approx. 6km from the kennels) is included in connection with the start/end of your tour. These tours run in mountainous terrain and often in areas without pre-prepared tracks. The route descriptions given are intended as guidelines only. Typical daily sledding distance is around 25-45km. The distances covered, time taken to complete these distances and the routes taken are subject to change depending on weather and trail conditions. Meet at the kennels at 10.00 in the morning (or pick-up from local accommodation in Beitostølen resort), where together with your guide you will make preparations for your tour. Once ready, it is a short transfer (20-30 mins) to the end of the road and the start of the wilderness! Here you will have an introduction in how to handle the sleds and your team, before you're off, driving your own husky team! You will typically be starting sledding by around 12.00-13.00. Your goal for the day is a traditional Norwegian mountain cabin - a genuine way to experience the Norwegian outdoors. The cabin has no electricity or running water. Everyone assists with the tasks around the cabin such as taking care of the dogs, fetching water, washing up, etc. After breakfast for dogs and humans, you will pack the sleds for your return to base. You sled back towards the kennels, making a stop for lunch, arriving in the afternoon (typically around 16.00). Here it's time to organise the equipment and say your farewells to the dogs, and your tour is at an end! Transfer to local accommodation or for bus to Oslo. The intention is to spend expedition night(s) in cabin, but camping equipment is also taken to allow night(s) to be spent in tents if challenging weather conditions make it unsuitable to reach the cabins. Meet at the kennels at 10.00 (or pick-up from local accommodation in Beitostølen resort) in the morning for introduction and to go through your equipment. Your first day's sledding is a day tour in some of the stunning local scenery of the area. Today you will sled on prepared trails and in a more sheltered forested area compared to the more exposed terrain of the higher mountains, which offer an ideal chance to settle in to the experience of sledding, gain your confidence and begin to get to know your dogsled teams. Accommodation this night is at simple cabin back at the kennels. In the evening you pack and prepare for the expedition component ahead, and can take part in all aspects of caring for the dogs at the kennels including feeding, etc. Dinner is served outside or in heated "dome" depending on weather conditions. For the next 2, 3 or 4 days, you will explore deeper into the area on the expedition component of your tour. You will normally have a short transfer to the start point at the end of the road, then ready the sleds to head out into the white wilderness. The route taken can vary depending on length of tour and weather/trail conditions, but you will typically plan to move between mountain cabins and may often be sledding in areas with no prepared trails. There's likely to be a number of uphill sections and much of the sledding in the area is above the treeline. 3-day and 4-day tours will typically explore the Langsua area, while 5-day tours also include (weather permitting) areas of Jotunheimen National Park. Once the days' sledding is over and you arrive at your cabin for the night, there's lots to do and everyone takes part. The dogs always come first, and you stake them out on their lines for the night and feed them. Once the dogs have been seen to, it's time to take care of the humans - chopping firewood to heat the cabin, assisting with dinner preparations, and reflecting on your day in the mountains in the evening. On your last day of sledding, you are typically back at the kennels around 16.00, where you organise equipment and your experience is at an end. Transfer to local accommodation or for bus to Oslo. NB: Unlike many of our dogsled experiences, these tours do not include arrival/departure day in their duration. You will need to arrive in the area the day before to overnight locally in the Beitostølen resort area. Scheduled dates are given for 3-5 day tours only. 2-day tour dates can be added on request for min. 2 persons.. Private tours on other dates, duration 2-5 or more days, can also be offered by arrangement (subject to availability). Please contact us to discuss your requirements. Prices are in British Pounds and Euros. If you wish, you are also welcome to make your payment in Norwegian Kronor (NOK) - please contact us for details. Supplement to drive own sled: As standard, tandem sleds are used where two persons drive at the same time. If you wish, it is possible to upgrade to have own sled. Snowshoeing and ice fishing day: Offered daily on request (min. 2 persons required). Suitable as an add-on before or after your dogsled tour. A snowshoe tour through one of the region's most beautiful valleys to a spot where you take out the ice drill, drill a hole in the ice and with luck catch some trout using the ice fishing equipment provided! Your guide will prepare a delicious wilderness lunch outdoors before you return to the kennels. Accompanying you for the day will be one or two of the huskies from the kennels, who assist in carrying some of the equipment and provide some four-footed company on the trip! Total duration approx. 4-5 hours. Note that overnight accommodation is not included - you will need to arrange an additional night's accommodation in the area. Extra night in cabin: Ideal for the night required locally before your tour begins or for additional night(s) locally before or after your tour (for example if choosing the Snowhoeing and Ice-Fishing add-on above). The two cabins are those normally used for the first night of the tours - see under "What's included" for details. Base price is total for 1-2 persons with additional price for each extra person. Bed linen is provided. From the cabins, it is approx. 4.5 km (about 50 mins' walk) into Beitostølen village or transfer can be arranged locally for 75 NOK (about £7.50)/person/way if required. For tours 3 days and longer, the first night's accommodation is in simple cabins at the kennels. The cabins offer shared sleeping accommodation, one cabin with bunk beds for up to 4 persons, the other with king size bed + extra folding bed. Facilities differ slightly depending on the cabin allocated, and are simple but cosy - for example, one cabin has no electricity and running water, while another cabin has simple electricity. Both have simple kitchenette (for use if you are staying extra nights before/after the tour with self-catering) with essentials such as olive oil, salt, pepper and sugare provided. The cabins are situation 20m-200m from the kennels. There are outdoor toilets and shower facilities available in the kennel building. For the overnight on 2-day tours and for expedition nights for tours 3 days and longer, accommodation is in wilderness mountain cabins depending on tour length chosen (except for tour dates which may be specifically marked as camping tours). For cabin tours, the intention is to spend all nights in cabins, but camping equipment is taken as a precaution and one or more night(s) may be spent winter camping if weather conditions require. The cabins are simple with shared sleeping rooms (normally bunk beds), no electricity or running water and heated by wood-burning stove. Everyone assists with tasks around the cabins/camp such as chopping firewood, fetching water, washing up, etc. All meals from lunch on arrival day to breakfast on departure day (breakfast, lunch, dinner + coffee/snacks, etc). Please let us know if you have any special dietary requirements. All necessary equipment during dog sledding tour including sleds and dogsled team. For tour durations up to 4 days, participants will normally drive tandem sled one per two persons. For odd-numbered groups, a single sled will also be used. For group sizes 7-8 persons, two solo sleds will normally be used for a tour for additional storage space. For tour durations 5 days or more, single sleds are used for all adult participants (any youth participants will share tandem sled with adult). Warm winter clothing for all activities: snowscooter overalls, winter boots, hat, gloves. NB: Please provide height, weight and shoe size on booking. Sleeping bag, sleeping sheet and sleeping mat. Tent and camping equipment for emergency backup. Bag for personal items and clothing. Return transfer between local accommodation in Beitostølen resort and the kennels in connection with start/end of your tour. If staying outside Beitostølen, additional transfer charges may apply. General good health and level of fitness. You should also be comfortable living in close proximity with others. Minimum age 14 years (for private tours, younger participants may be possible by arrangement - please contact us to discuss your requirements). No previous dog sledding experience is required. Dog sledding can be physically demanding. You must be able to brake the sled when going downhill and also assist the dogs during uphill sections by stepping off and running behind the sled for short distances. 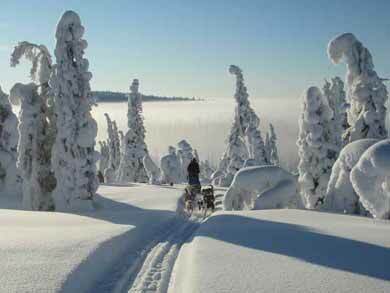 These aspects are both facilitated by the tandem sled arrangement for this tour. Tasks around the cabins (fetching water, chopping wood, etc) can also be physically demanding. With tour durations available from 2-5 days (or longer for private expeditions), this experience spans a range of level of challenge. Longer tours will typically have higher level of challenge and may be considered "Hard". The nature of the terrain and mountain environment means that the level of challenge can vary significantly depending on conditions. During ascents, you will need to assist the sled and team by pushing uphill, perhaps in deep snow. You should have a general good level of fitness and enjoy the outdoors and living in close proximity with others. Longer tours can be particularly suitable as "next step" tours for participants who have done some dog sledding previously, though previous experience is not required. A total of minimum two persons is required for tours to run. You are of course welcome to book as a solo traveller. Maximum group size 8 persons for scheduled 2-day, 3-day and 4-day tours, maximum group size 6 for tours 5 days or longer. This experience is also available as a private tour for 3-8 persons with flexible dates and duration by arrangement. Please contact us to discuss your requirements. This provider has a detailed environmental policy. Fly to Oslo for bus (approx. 4 hours) to Beitostølen. You will need to overnight there before and after your tour. Recommended by Adventure Travel magazine as one of its "Epic Adventures for 2018". You can also go hiking in the Jotunheimen mountains in summer.